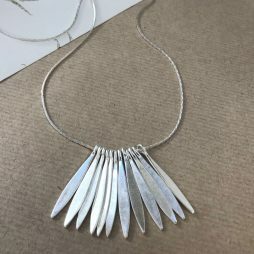 One of our most popular designs, this statement necklace features a row of matt silver frongs on a silver chain necklace. 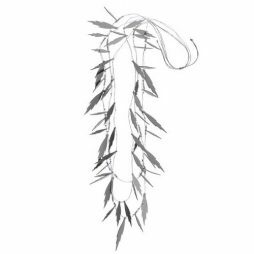 This wonderful necklace responds to your every move making it one of our favourite must have pieces this season. 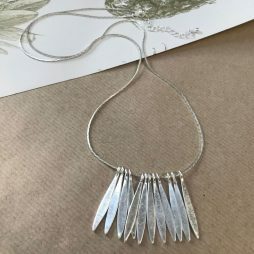 Tactile new multi stand Hot Tomato Jewellery necklace featuring soft faux leather leaf detail and tiny sparkling pewter beads on a silver thread necklace to create a highly flattering piece to wear effortlessly day and night. This wonderful necklace elegantly responds to your every move beautifully making it one of our favourite must have pieces this season.